Need a shirt for Prom or Church and want to breathe some new life into your suit collection. 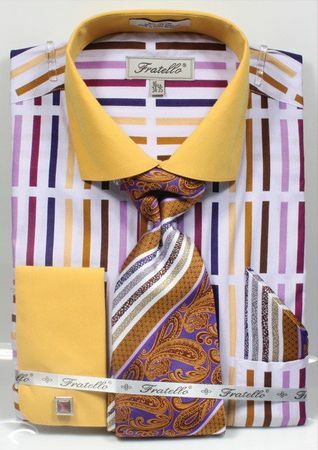 Try the fancy style dress shirt and tie sets with by Fratello. Fratello has a way with French Cuff Dress Shirts that will blow peoples socks off when they see you all decked out. This Mustard color multi stripe French Cuff Dress shirt and tie set comes exactly how you see it. Fabric is cotton/poly easy care.